They Are Doing It Again Sale!!! 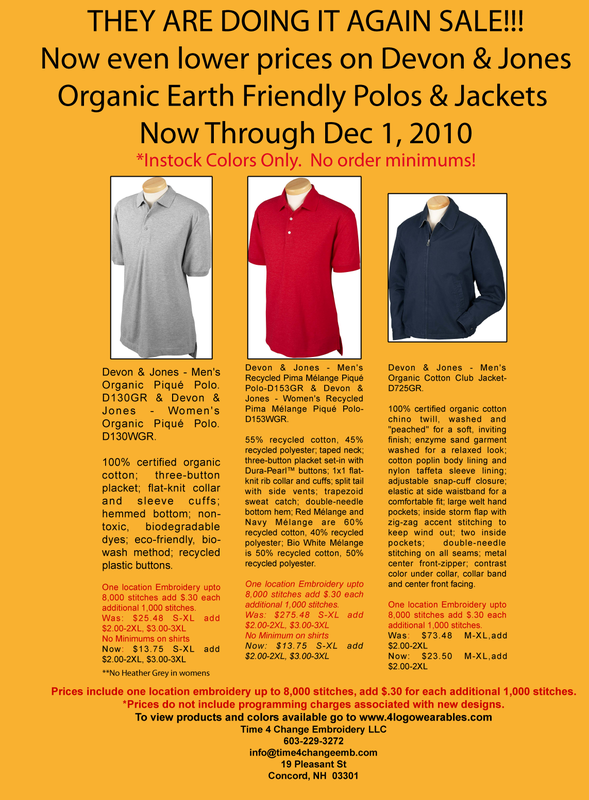 Once again Devon & Jones has lowered the prices on their Organic and Recycled Polo shirts as well as Cotton Club Jacket. A great opportunity to take advantage of some even further discounted prices on some really great products. Looking for Holiday Gifts for your Staff, Customers or Friends? And yes once again NO ORDER MINIMUMS!!! 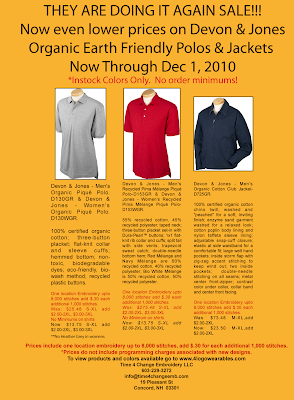 Sale prices are available on all in stock colors until Dec 1, 2010 **Note: Heather Grey in the Women's D130WGR is currently out of stock. Please e-mail, call or stop by if you have any questions. Just a reminder if you ever misplace one of our sales fliers you can always find the most recent specials on at www.time4changeemb.com just click on the blog link on the left-hand side of the page. Like us on Facebook (Time 4 Change Embroidery, LLC) and you will always be up to date with the latest happenings at time for change or you can join us on twitter at Time4ChangeLLC.